– Undefeated World Boxing Association (WBA) 168-pound champion and America’s last Olympic Gold Medalist Andre “S.O.G.” Ward (20-0, 13 KOs) made his “pitch” to his hometown fans in Oakland, CA to come out and support him when he defends his title against world-ranked contender Allan “Sweetness” Green (29-1, 20 KOs), of Tulsa, Oklahoma, at the Oracle Arena on Saturday night, June 19. 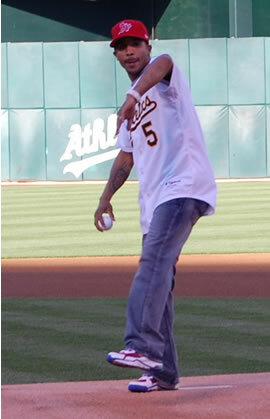 “I can’t tell you what an honor it was to be able to throw out the first pitch at an A’s game,” Ward, an avid baseball fan, shared. “I am a big supporter of the A’s and all the Bay Area sports teams, and I look at myself as Oakland and the Bay Area’s pro boxing franchise since there is no such thing as a major league boxing team. So I go into each of my fights with that in mind and it gives me extra motivation to prepare and fight to the best of my ability. I take a great deal of pride in representing my home area as its only current world champion. Tickets for the June 19 Super Six World Boxing Classic are priced at $300, $150, $65 and $35 and are available at the Oracle Arena Box Office, 7000 Coliseum Way, Oakland, CA 94621, Phone: (510) 569-2121 or online thru www.Ticketmaster.com.